Many of you have worked with me at my shared studio space in Mt. Pleasant, DC. Some of you have inquired about purchase of the large canvas photographic prints hanging on the walls. Well, this is your opportunity to see the studio if you haven’t already, mingle with other clients and guests, and place an auction bid for the studio prints (or make a sure-fire bet of ordering a copy). All proceeds from the auction benefit a great organization. This event commemorates the first year anniversary of this incredible yoga studio that we are so honored to be a part of. So join us if you can! 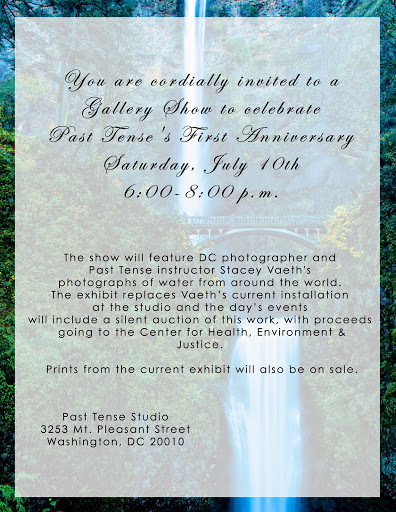 The show will feature DC photographer and Past Tense instructor Stacey Vaeth’s photographs of water from around the world. The exhibit replaces Vaeth’s current installation at the studio and the day’s events will include a silent auction of this work, with proceeds going to the Center for Health, Environment &Justice. Prints from the current exhibit will also be on sale.